The Can O Worms was the first ever worm farm I used. I purchased my Reln Garden Can O Worms (formally known as Tumbleweed Can O Worms) a few years ago now from a local hardware shop. 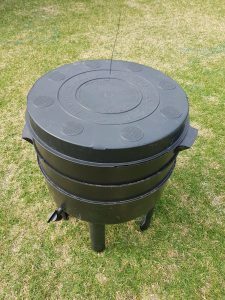 The worm farm is an affordable and simple designed 2 tray worm bin. This makes it an excellent choice when starting out. In this Can O Worms review, you will find out why this bin is great for beginners. In addition, I compare some of it’s shortcomings compared to other bins. Can O Worms worm farm standing upright. 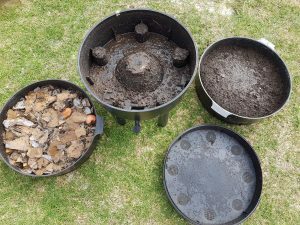 A basic 2 tray worm bin system. The Can O Worms worm farm is a basic 2 tray worm bin system. The worm farm design is simple and easy to maintain. The trays are quite large in size. Only 2 trays are necessary. The tray on top is where the food goes (the working or feeder tray). Find out how to feed your worms. 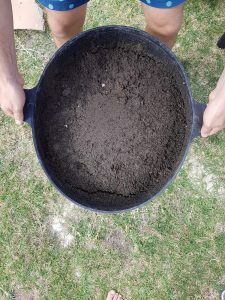 By the time the top tray is full, you can harvest the worm castings in the bottom tray. The trays are quite heavy to lift when full. Also note the trays can get stuck and be a little tricky to pull out. The shape of the bin is a little unique compared to other worm bins. It is cylinder in shape. Not a bad thing. A spigot attached to the liquid collection tray makes it easy to collect worm farm leachate (worm tea). The bin is made from recycled plastic. One common complaint is that the plastic is cheap and not very strong. However I find it strong enough to do the job it needs to do. The Can O Worms worm farm is easy to maintain. There’s lots of space to feed the worms. The appearance of the bin has an appealing design. Yet in my view the round shape does not make the best use of space. For instance it does not fit snug against a straight wall. In addition to this, whenever you cover up food with newspaper or cardboard, you will never be able to tear it perfectly to fit along the rounded sides. This can be a bit annoying. The bin comes in color black only which will absorb more heat. This can be a good thing or a bad thing depending on your climate. I would not worry though, it is pretty easy to regulate worm bin temperature. The legs buckle under weight which can give the impression of poor quality. The 5 legs spread the weight of the bin and on a flat surface this is less of a problem. If you are enjoying this Can O Worms review, then you may want to check out our helpful buying guide for worm farms which contains comprehensive reviews. The Can O Worms worm farm parts are easy to assemble. 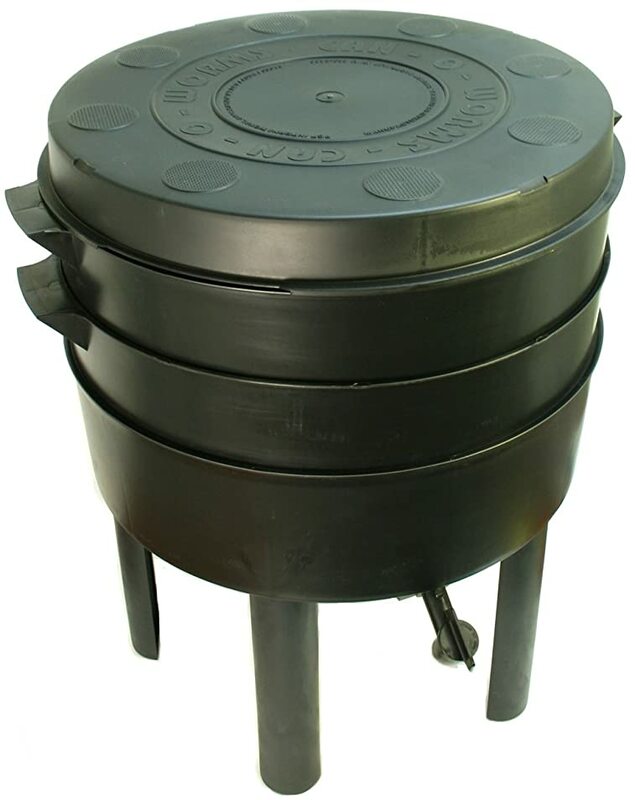 There’s a lid, 5 legs, 2 trays, a liquid collection tray and a spigot. Basic instructions are provided to help you assemble the Can O Worms worm farm. It is simple to assemble and only takes a couple of minutes. The legs click in, the spigot screws in and then the trays sit on top of each other. The bin is made from plastic which is not very breathable. Each tray is large in size which creates lot of air space in the top tray. Also, the lid contains lots of tiny air holes. Some rainwater may get in but I have not found this to be a problem. The liquid collection tray needs to be cleaned once a month. Otherwise it will become a slushy mess and block the drainage. Excess liquid drains into a liquid collection tray on the bottom. The tray has a spigot attached which makes it easy to drain and harvest worm farm leachate (worm tea). The liquid collection tray is large in size. This improves airflow to the bottom tray. And it also means you do not need to collect the worm farm leachate or worm tea that often. I leave the spigot open with a small bucket sitting underneath so I don’t need to worry about this. 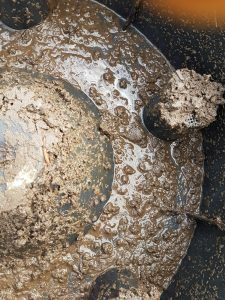 Worm castings will fall down into the liquid collection tray which can become a slushy mess. You will need to clean the liquid collection tray once a month to avoid any drainage blockages. Note in hot weather you might find your worms cooling down below. Luckily there’s a sloped worm ladder so that they can find their way back up. The trays are quite heavy to lift when full. As you can see, the plastic bends due to the weight. The size of the bin is very large. This helps provides lots of air space and room to spread food. However it can make harvesting the worm castings a bit more strenuous. And you will occasionally lift the trays for general housecleaning and checking the conditions in the bin. It might take 2-3 months before the top tray gets full. Obviously price is a factor in our Can O Worms review. The Can O Worms is one of the more affordable worm farms on the market. You can expect to pay less than $100 USD which is a bargain. 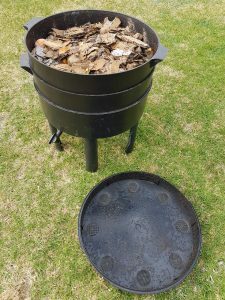 This Can O Worms review explains why we think this worm bin is ideal for beginners. I used this bin when I first started out. It’s affordable, holds a decent capacity, has a nice appearance and is easy to maintain. What more could you want?